Dr. Mariano Mora, right, a resident in Equine Internal Medicine at Auburn’s College of Veterinary Medicine, is among the 2017 recipients of the AU Outstanding International Graduate Student Award. He is shown here with his residency advisor and major professor, Dr. Anne Wooldridge, who nominated Dr. Mora for the award that is determined by faculty vote. 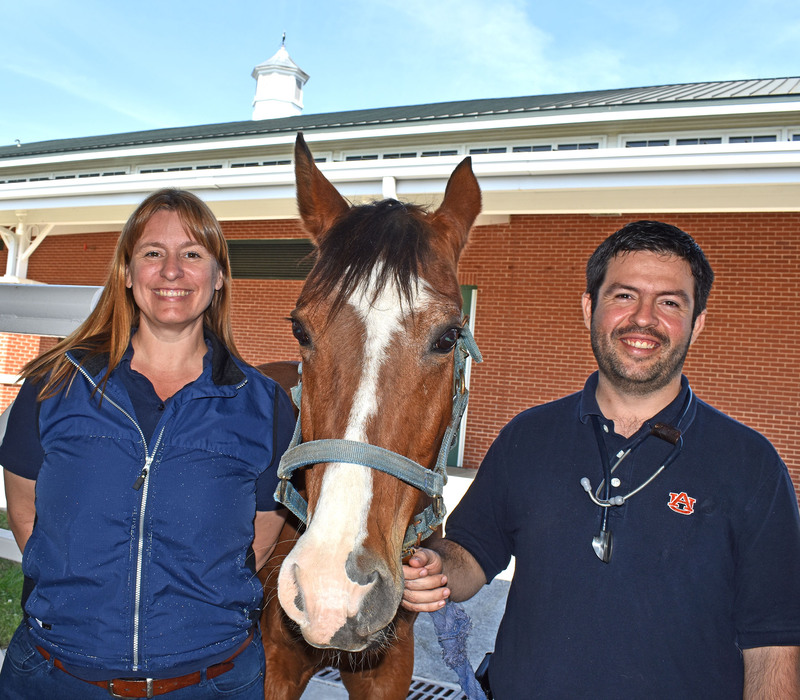 Dr. Mariano Mora, a resident in Equine Internal Medicine at Auburn’s College of Veterinary Medicine, is among the 2017 recipients of the AU Outstanding International Graduate Student Award. Dr. Anne Wooldridge, an associate professor in the Department of Clinical Sciences and Dr. Mora’s residency advisor and major professor, nominated him for the award that is determined by faculty vote. A native of Costa Rica, Dr. Mora teaches and performs clinical patient work as well as conducts research on drug delivery techniques for treating fungal infection in horse’s eyes. “That is a very common condition in the Southeast, due to the intense humidity” Dr. Mora said. Fungal infections typically start with a scratch on the horse’s eye that becomes infected, Dr. Mora explains. The present treatment process involves topical drops that must be applied to the infected eye at least every four hours. Treatment may last for up to three months before the fungal infection is cured. Dr. Mora’s delivery method under study involves a gel form of the drug that is injected into the tissue surrounding the infected eye. “We are using a commonly used drug in this research, but we are testing and evaluating a new system for sustained release,” Dr. Mora said. Dr. Mora’s research is still in the experimental phase. “We still have much testing to do, but our goal is to determine if this new drug delivery system can shorten treatment time, or, decrease the frequency of treatments necessary,” Dr. Mora said. “If proven to be a successful drug delivery method, this could improve the presently used eye fungal treatment process by reducing time, frequency of treatments needed and cost,” Dr. Wooldridge said. Dr. Mora received his veterinary medicine degree from the National University of Costa Rica. He spent time in private practice in Costa Rica and Mexico and served an internship in Canada at the Ontario Veterinary College, University of Guelph. Upon completion of his residency at Auburn this July, Dr. Mora also will have earned a Master of Sciences Degree in Biomedical Sciences. “I want to stay in academia,” he said. Dr. Mora plans to pursue a doctorate degree and hopes to combine his interests in teaching and research as a member of a veterinary medicine faculty at a North American university.